I’m Write and You’re Wrong. 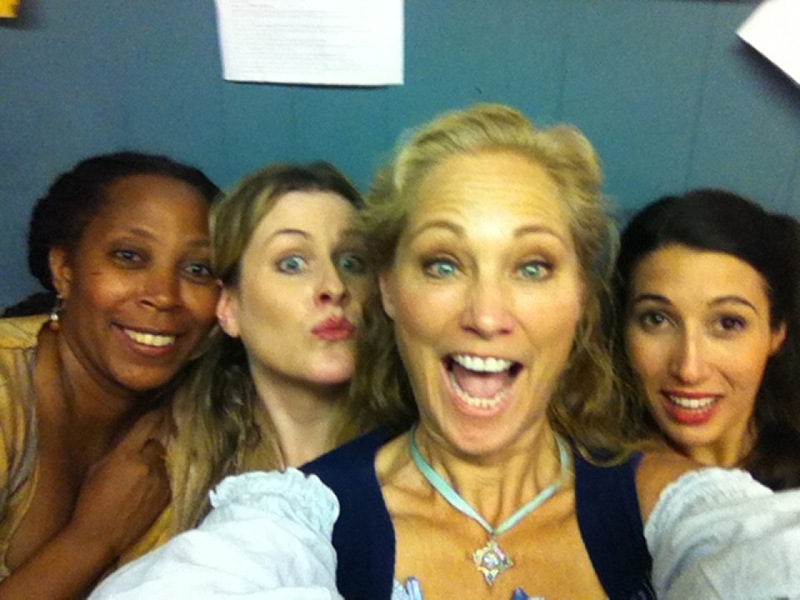 Backstage at “Much Ado About Nothing” with three women who are terrific friends. As the publication date of “Invisible Ellen” looms ever nearer, and the premier screening of “Scream at the Devil” is less than two weeks away, I find my focus turning to two things, reworking the book’s sequel, “Emerging Ellen,” and making time for my neglected friends. I’ve been in a work frenzy for the last year, and I have a rather large family, who must, by needs, often come before friends. But now I find myself longing for that simple shared laughter and warm support that only a long time friend can offer. And friends, I realize, could sometimes benefit from some attention from me! As for the new book, I am doing something I’ve never done before, (though that, in itself, seems to be a theme in my life!) I am removing one complete story line and replacing it with another. Not because I don’t like it, not because it doesn’t have it’s value, heart and excitement, but because I think I’ve gone one plot point too far, and I want to spend the wordage on the building of character. Sound familiar? They are both the same thing, aren’t they? I could continue to focus on work—which is to say, plot, story, complexities, etc—or I can balance it with time spent with friends—character, laughter, tears, and the arc of developing relationships. As always, I choose both, but my focus, and therefor my time, will be split more evenly. There’s no right or wrong way to live your life, there’s no ‘supposed to’ or ‘rules,’ there is only what you can do with the strength and passion you have. There are only the choices you make. Do you spend your time seeking ‘success’? Money? Fame? Or do you give to family until there’s nothing left for you? Do you know that there’s a place in between? For us all, there are times, times of great sadness or stress, when we have nothing left to give, and that is when, hopefully, we can turn to others, for a little while, to cast the net that keeps us from falling. And sometimes, we are the ones who need to ‘spot’ our friends, to catch them when they fall. One good friend just had a baby. She was not trying to get pregnant, did not particularly want children, but it happened and she embraced it, but now finds herself overwhelmed. She said to me, “I don’t really know who I am right now.” Everything in her life is being redefined. I will do what I can to be there for her, to take the baby for a few hours so that she can breathe and remember who she is. I will take her for walks in pretty places so that she not only remembers who she is, but also discovers the magnificent new person she is becoming. And I will devote some of my attention to lauding her for the strength it takes. I have another friend whose husband passed away a month ago. He drank himself to death, and in the process of his destructive behavior, he left her in a legal and emotional battlefield which she must now face alone, deserted by him. I cannot bury my face in my computer and ignore her pain and need. I might not be able to fix all that, but I can remind her of her grace and class, buoy her up to face the legion of lawyers and the nightmare of uncovering the depth of her husband’s betrayal. I will talk to her as often as I can, I will take a day off to visit a museum with her and remind her that life is bigger, that there is more, that the future holds beauty. These things take time and energy to do well. That time and energy will come from other areas of my life that will have to slip from fevered pitch to low idling hum. But I feel lucky all the same. What more can we do? I cannot live others lives for them, they must do that, I am only a character in their story. Writing a book, I can change the story, I can effect the change that brings about the ending as I want it to be, and I truly believe that it is the same in life. We create our friendships and relationships in a different way, and to a different degree, but we can rewrite our story, we can be a strong supporting cast in the dramas that belong to others. And this, we must do, not because it’s the ‘right’ thing to do, but because it makes us complete. I decided long ago, or perhaps ‘realized’ is more the mot juste, that I need balance to make a real life and be happy. Success to me, equals happiness, not fame or money, or the envy of others. I needed something besides the pursuit of stardom and big houses, that is to say, the things that other people tend to envy. What I needed was to contribute sometimes, and sit back and revel other times, in sunlight on leaves, on the victories of others. What use is a life lived only for how it appears to others? The greatest danger there, in this world of social media and constant exposure, is that people invent themselves to look good to others… and then they begin to believe it. And then they can’t live without that approval and admiration, because they have nothing else. And Michael leaned around his makeup artist and said in that charming cockney accent, “The Italians have got nothing on the British. In England, they make it up…and then they prove it!” We laughed about it. So, make up your own story, but live it honestly, and make the story about you, not about someone else. Do it for you, not for what you think others see. Give because it makes you better, spend time supporting and cheering for your friends, and even strangers, because it fills your heart and reminds you that we are connected and that without that connection, we are unfulfilled and no trip to the mall, no McMansion will ever fill that frightening void of separation. Remember only this, other’s lives belong to them, yours to you. Own it, fill it, live it, share it, and do it for love and joy. Write your own story, so that when you read it back, you smile.